I have tried every single possible grocery planning method over the past 7 years that I’ve been in charge of feeding myself (and anyone else who came along and depends on me to feed them). 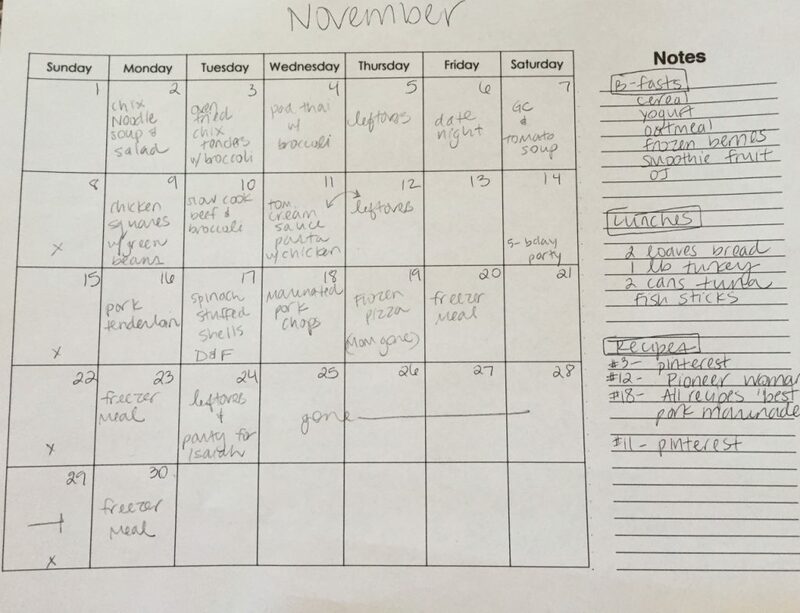 My go-to method for the past couple years has been weekly meal planning. For a long time, I didn’t really mind it. I like thinking about meals and making a list. Call me crazy, but I even like grocery shopping. 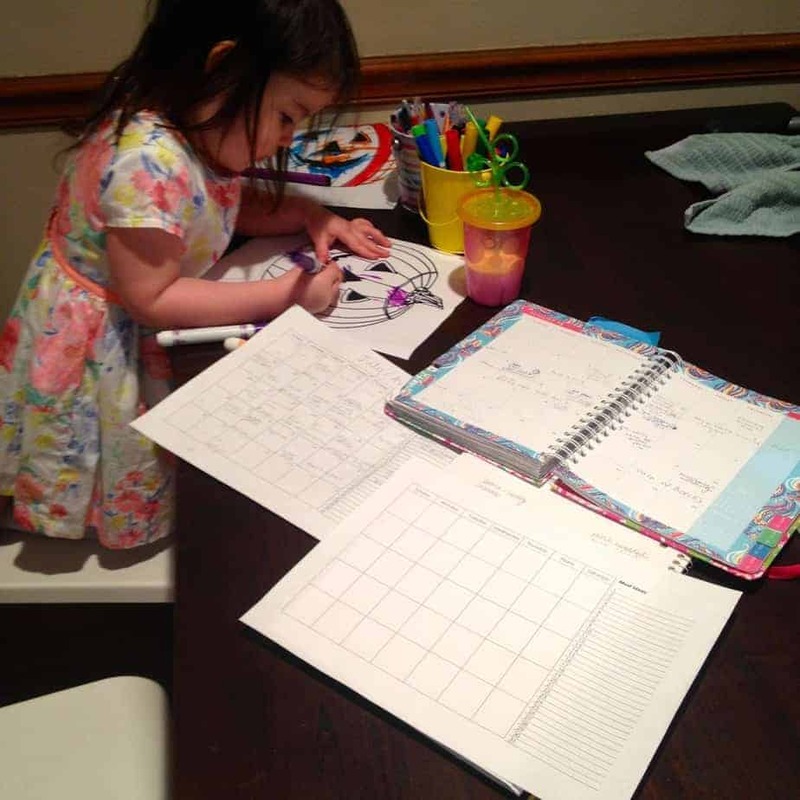 As a stay-at-home-mom, it was something for Addie and I to do to get out of the house. This grocery trip would take at least an hour or 2, plus unloading groceries, putting everything away. It ate up one of our mornings every single week, but I didn’t really want to make time for it on the weekends or evenings either. So, I started bi-weekly planning and going just twice a month. And then, I realized, if I planned really carefully, I could go grocery shopping just once a month. ONCE A MONTH!! Sound impossible? Not only is it possible, but I’ve grown to love it. It’s a huge time and sanity saver for me. I realize it might not be a method for everyone, but here are 5 reasons I love grocery shopping once a month and a few tips to make it work. 1. It saves us money. This is probably pretty self explanatory, but the less you go into the store, the less you’re likely to buy. Especially once I started meal planning and shopping with toddlers, it was so hard to stay focused during either of the tasks. I would forget stuff, have to make extra trips and, end up with stuff we didn’t need. 2. We waste less food. Because my new goal is to go to the store as little as possible, we eat more of what we have on hand. Occasionally, like any mom of littles who has lost almost all her ever loving mental abilities, I forget an ingredient and ask Ben to stop for something on the way home. But mostly, we just do without, and end up eating more of what we have around. 3. I always have something on hand for last minute guests. I love to cook, but as a mom of toddlers, this is not the season for gourmet meals. In fact, once or twice a week, I put something REALLY basic on the menu because cooking exotic meals on a regular basis is off my balance beam right now. (You can read more about the beam over here.) BUT, I do enjoy cooking and like to try new meals now and then. I usually put 4 interesting, tasty, guest-worthy meals on the menu each month. Because I shop for all the stuff at the beginning, I already have everything I need in case emergency dinner guests show up. Okay, so people don’t usually show up on the doorstep in need of a meal. But, this method does give me freedom to invite people over last minute stress free. Which we end up doing, and it’s always fun! With the exception of using fresh ingredients that easily go bad, we don’t have to eat the meals on the month at any particular time. If I planned lasagna but don’t feel like making it, I’ll swap it out for pad thai and eat lasagna a different day. 5. It takes less time overall. Weekly meal planning and shopping seemed to take me about 3-4 hours per week, which was about 12-15 hours a month! In order to successfully meal plan and make a list for a month, I have to do it without kiddos around. Then, I can plan in less than an hour. I go shopping once a month, also without them, and it takes 2-3 hours… again, because I hit multiple stores for the sales. If you just went to one store, I’m sure you could do it in less than 90 minutes! So, 3-4 hours total for all our groceries? Yes, please! Here’s how I make this work with produce and other stuff that expires. In addition to one big trip at the beginning of the month, I cheat and make 2 quick Aldi stops for produce throughout the month. Seems like I need to run there about every 10 days-ish. Frozen green beans. I wait till these particular frozen fresh green beans are on sale for $1.00/ bag and then buy 6. (We usually go through one a week and a lot of grocery items tend to rotate on sale every 6 weeks ish.) I’m a tiny bit of a frozen veggie snob, and have a strong preference for these compared to regular frozen green beans. Also, our kids love green beans! Salad stuff & fresh broccoli or some other green veggie. We usually do one veggie with each meal, so we eat the salad stuff first, then the green veggie, then the frozen ones. By this time in the month, I’ll run to the store for produce only and repeat. Sometimes in one of these quick trips, I’ll have to get some cheese, eggs, or milk. Any produce needed for my first 2 weeks of meals. I buy 6-8 gallons of milk on sale at the beginning of the month (assuming the expiration dates are usually about 2 weeks away). We use up half of those in the first two weeks, and I freeze the other ones. DID YOU KNOW YOU CAN FREEZE MILK!? I was skeptical when a friend told me she does it, but I figured I’d try it. Worst case scenario: I’m out $2.00 and there’s an exploded gallon of frozen milk in my freezer. She was right, though! I’ve been doing this for month and it’s never exploded. No need to dump any out, either. Just pop the new gallon, unopened, into the freezer. Let it sit in the empty sink 24 hours or so before you need to use it. I buy meat up front at the beginning of the month and freeze what I’m not going to use within that week. The one thing you have to be careful of is you can’t thaw and then re-freeze raw meat. Once it’s thawed, you have to use it. We go through a dozen or so eggs per week, so I just calculate how many dozen I should get up front based on the expiration date on the carton when I go. Sometimes I’ll grab another dozen or two when I’m out on one of my quick produce runs mid month. Same with blocks of cheese. We go through a lot of cheese!! I grab 10 blocks at the beginning of the month (I usually shred it fresh if needed), and this will last us the month. As I’ve gotten used to it, I’ve really grown to prefer it. Though I know it wouldn’t work for everyone, it’s a huge time and sanity saver for me. 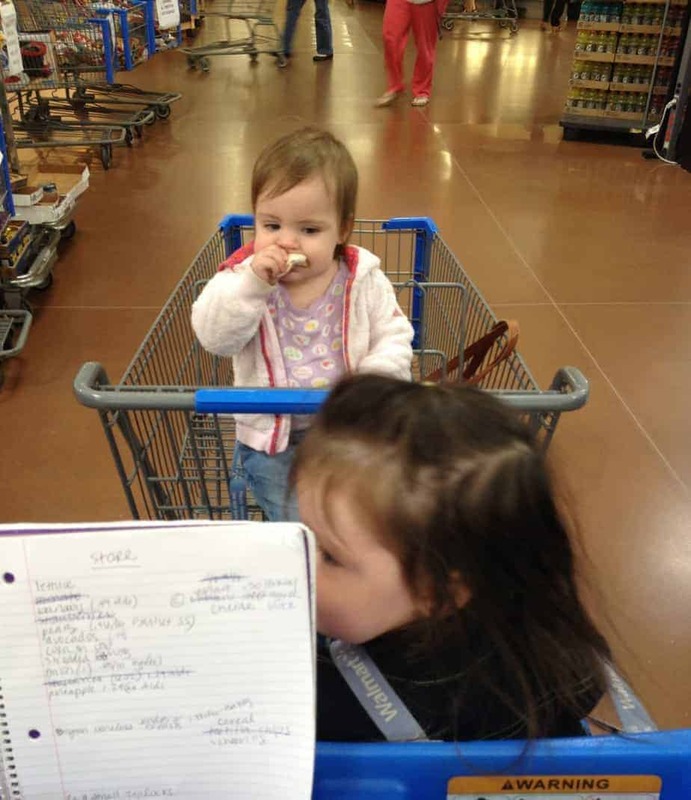 My “how to” guide for once-a-month meal planning and grocery shopping is over on Money Saving Mom. What do you think? 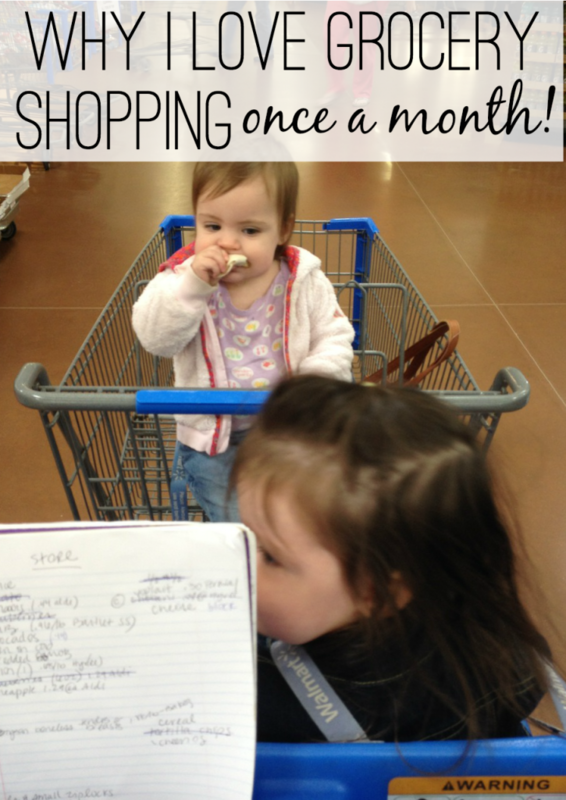 Have you ever tried or considered shopping once a month? Here is the meal planning calendar I use free for you to download if you want to meal plan for a month at a time. Thank you for sharing! But I’m really wondering… Where do you store all of that cheese, etc.? I’ve considered this concept several times, but always end up ditching the idea when I re-realize that I don’t know where I’d put it all! Please share your tricks! It’s hard to know exactly. Generally I’ve read it’s every 4-6 weeks. I usually by 6 weeks worth and if it goes on sale again within 6 weeks, I just make a mental note of how frequent it was. Also, I find meat and produce to be in 4 weeks or less. I really try not to go over budget in order to stock up. It’s not worth it. 🙂 And then, I also try to menu plan around what’s on sale when I go to the store rather than always stocking up on items i think i might use. Hope that helps! Hi Renee. I haven’t been able to find an easy way to track how long it will be before an item I use often will be on sale again. I’m trying to be able to determine how much to buy to get me through to the next sale. Hi Cheryle, do you mean like how often a particular store rotates particular items? Hi Renee. Do you have any tips on figuring out what the sales cycles are at a particular store?